Yeah I'd say so!! Get the bread in! For the love of god, don't forget the tayto crisps. When the power goes, crisp sambos will be all we have. You guys have me freaked out...is it too early for a red warning? Or a bread warning? .... showers turning wintry on northern hills at the weekend! The main point I was getting at (considering this is the Winter thread after all) was that it's very early to be seeing a Siberian High on European charts and some notable harsh Winters have been recorded with a Siberian High appearing this early such as 1946 and 2009 the example I gave (although they featured two very different Septembers , 1946 was very wet and cool with a harvest emergency whilst 2009 was a huge relief with very dry and pleasant conditions following one of the wettest Summers on record). It's certainly something to watch. Whilst that itself might not be a clear sign of settled weather for Ireland, the chart from the model shows a blocking area of high pressure over top of the country at the end of August into the start of September. This continues to be the case on the latest models but exact temperatures, high pressure alignment etc are to be revealed. That chart I showed would suggest low 20 temperatures widely with fairly low humidity and good sunshine. September 2009 featured a very similar chart by the way when it became very sunny for around 5-6 days especially in the west. So there might be some good news for you if you want settled weather. We'll be keeping an eye on the situation in the model discussion threads. In terms of the Winter discussion today, I'll be giving a solar activity special. Last edited by sryanbruen; 21-08-2018 at 12:20. If we do get a severe cold snap this winter, I honestly hope it is early in the season. While the spell early last March was acceptable, it occurred too late in the year. Either way, I hope this year is 'the one' for record breaking storminess. It will be such a pleasure to experience after this long long, endless Summer. January hopefully, if it happens during the Christmas rush like in 2010 I would probably go out of business. The hot weather this summer has killed my sales. Perfect selling weather is dull humid conditions during the summer. So.... I gave away in the above post that today's discussion post in regards to Winter is going to be about solar activity which will be a huge talking point this year because as of recently, it has plunged into minimal levels with more than 85% of the last 50 days being spotless on the sun. When spotless days occur this frequently, it's a sign you're in solar minimum. Solar minimum is a transitional period of time from one solar cycle to another and is when solar activity is at its minimal point. As briefly stated, majority of days during solar minimum are spotless on the sun. Solar cycles usually last between 11-12 years of occurrence and solar cycle 24 began in December 2008 which is expected to end here in the second half of 2018 by projections and predictions. This means, solar cycle 24 would be only 10 years long so would be a shorter solar cycle than the duration of a normal solar cycle. This is interesting because solar cycle 24 has already been so strange without even considering its duration. Solar maximum was the weakest and solar minimum of 23 into 24 was the deepest since the 19th century which was when the little ice age ended. This solar minimum of 24 into 25 is expected to be even deeper and the theory is that just before solar minimum, during solar minimum or just after solar minimum, there are increased chances of northern blocking over the Arctic Circle to go in favour of harsher Winters i.e. colder and snowier, for Europe. This is less the case in other continents such as North America where solar maximum is the most favourable for colder winters there. July 2018's mean sunspot number was the lowest since August 2009 and August 2018's mean sunspot number is expected to be similar here. 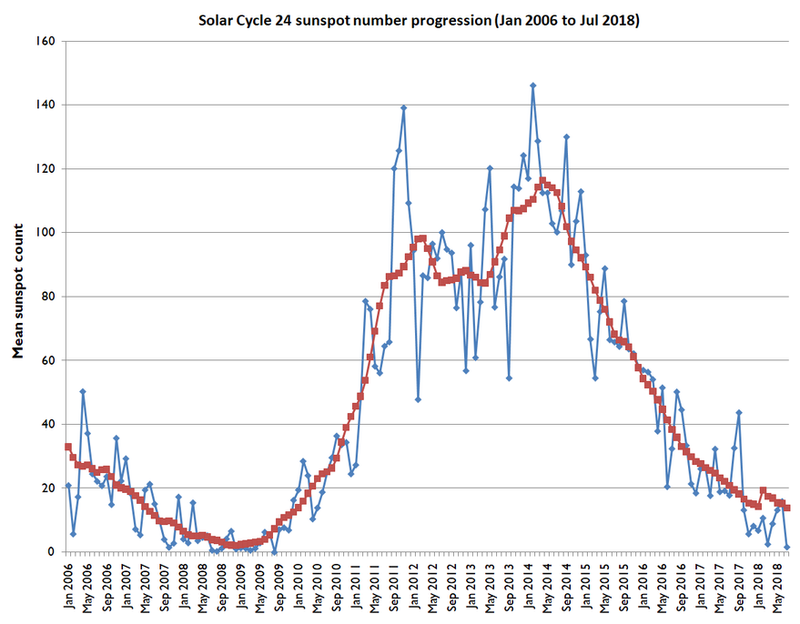 You can see the monthly sunspot numbers on my graph below from January 2006 to July 2018 along with the 13-month running average (I previously shared this graph in the solar activity thread but I'll repost it here because it's appropriate to the discussion in hand). As you can see, the 13-month running average has gone below a mean sunspot number of 20 and July 2018's SSN was just abouts above zero. The first graph here shows the correlation with increased chances of negative NAO with low solar activity. Notice 2009-10 particularly standing out. All of this just goes to show that low solar activity don't mean it's gonna be a cold Winter but there are increased chances given the increased chances of northern blocking to occur on the European side of the Arctic Circle. I'd like to give another interesting point that is somewhat relatable to solar activity and that's the Atlantic Meridional Overturning Circulation (AMOC) which if you do not know is a system of currents in the North Atlantic Ocean which includes the infamous Gulf Stream. 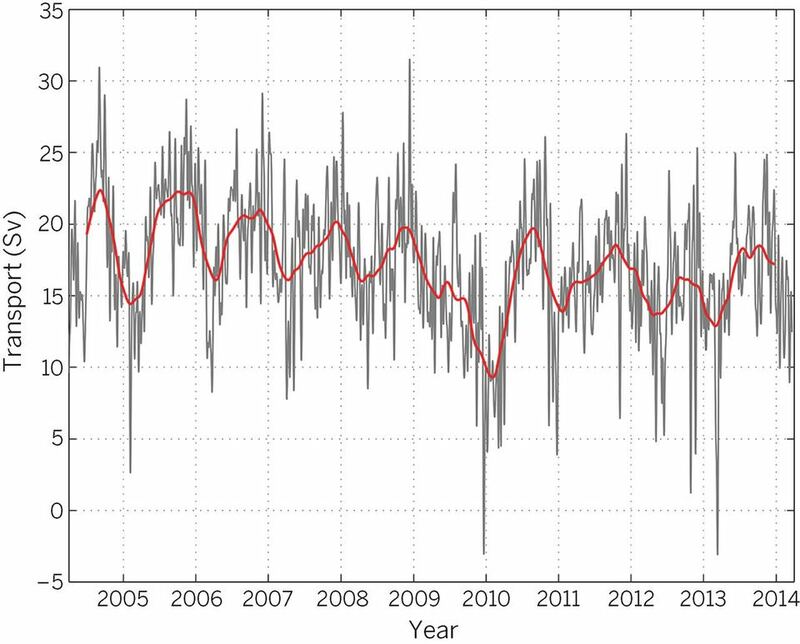 From 2009 to 2011, the Gulf Stream was the most south in decades and its speed was very slow which allowed for some unusually cold weather take place through the year of 2010 including the coldest December on record. Scientists predict 2020 to 2022 to fare similar to the period in question so if their predictions are correct, watch out for the possibility of some harsh Winters to come and this combined with a deep solar minimum..... oh oh oh.... good luck Ireland, good luck! Here's a graph of AMOC data and you can see the decline in 2010 clearly - also early 2013 interestingly enough! Data comes from SILSO and NOAA. Last edited by sryanbruen; 21-08-2018 at 15:25. Reason: Added sources and resized pics. Do you mind me asking what you sell Lucreto? Totally agree. You cannot beat snow before Christmas. Warm dull rainy days I do better. Need to get the kids out of the house they go shopping. When it's sunny they go to the beach instead. The more crappy the summer my business does better.